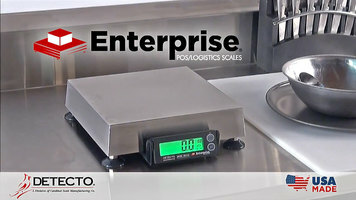 Detecto’s USA made Enterprise APS series digital scales are ideal for precise portion control weighing in pizza kitchens, delis, and bakeries. The scale’s vivid bright green backlit LCD provides clear visibility for ingredient weights in any lighting condition. The APS series comes in four different platform sizes with six different capacities. For this video, you’ll be watching the model APS160 which weighs completely in ounces. 160 oz. capacity by 0.1 oz. accuracy. The APS series can be equipped with an optional piezo tare button to expedite production in busy prep settings. Detecto’s piezo tare button is stainless steel and virtually indestructible so it will stand up to rugged treatment in any busy commercial kitchen. This handy tare button allows the weight of various ingredients to be quickly tared off while building finished products such as pizza or sandwiches. Both the LCD display and piezo tare button can be remotely mounted on the wall, countertop, or even the side of the countertop to facilitate an orderly working environment. By incorporating the optional tare button with the APS series, you now have the speed and accuracy needed for faster, more precise food preparation. This provides a more consistent quality output for the customer and tighter quality control without waste for the business owners. Detecto’s tare button utilizes Piezo touch technology which features no moving parts and is the toughest quality possible. An audible beep will alert employees that the ingredients have been tared from the scale and to notify them that the scale is ready for the next step in the food prep process. The button registers when pressed to tare the weight off the scale and return it to zero. The large button size, sturdy design, and discernible beep of the piezo tare button are crucial features for any fast-paced production work flow. Due to the rising costs of ingredients, especially meats like pepperoni, these features are instrumental in minimizing production costs. As you can see, the piezo tare button on Detecto’s APS series provides a fast, efficient work flow to your kitchen. Simply add your ingredients, check to ensure the proper amount of ingredients have been added, subtract or add additional ingredients to achieve the desired target weight for each stage, and press the piezo tare button to set the scale back to zero. Continue building each stage of the pizza to reach your target weight, and precisely measuring your portions every step along the way. Then, when you’re finished, remove the pizza and you’ll see the total product weight on the LCD. The piezo tare button for Detecto’s APS series can deliver a consistent, precise finished product every time. For more information about Detecto scales, please call (800) 641-2008 or visit us online at www.detecto.com. 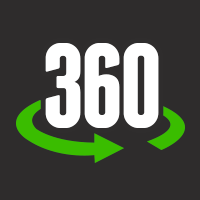 Detecto has been building a better way since 1900. 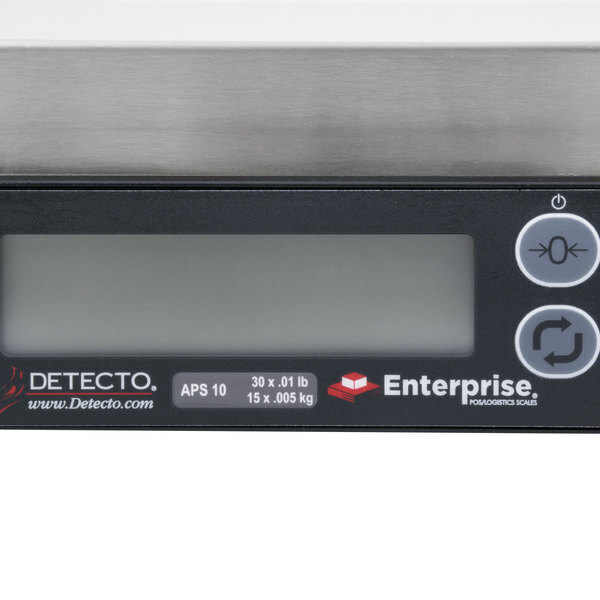 Ensure that your bakery, pizza shop, or deli is making consistent products with the Detecto APS series scale! Featuring Detecto’s own piezo tare button, you’ll be able to accurately measure ingredients, thus minimizing production costs. How can I contact Detecto if I need technical support for the item I purchased? If you need assistance with your Detecto item, you can contact their technical support team by calling (800) 641-2008, emailing [email protected], or going to their website and chatting with a live technician online. Detecto hours of operation are 5:00 am to 7:00 pm CST. If you need to contact Detecto after hours, you can leave a voicemail message, or send an email. The Cardinal Detecto APS10 30 lb. 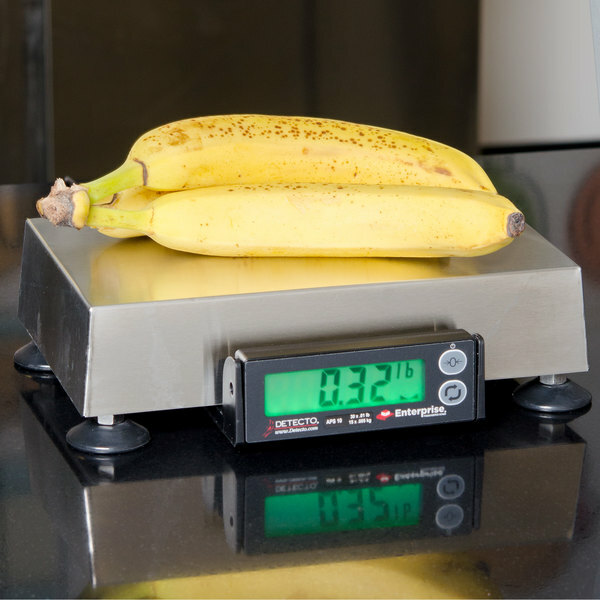 point of sale scale is ideal for weighing produce, fruit, grains, dry ingredients, or meat in your grocery store, market, butcher shop, or deli! Providing accurate readings from .01 lb. 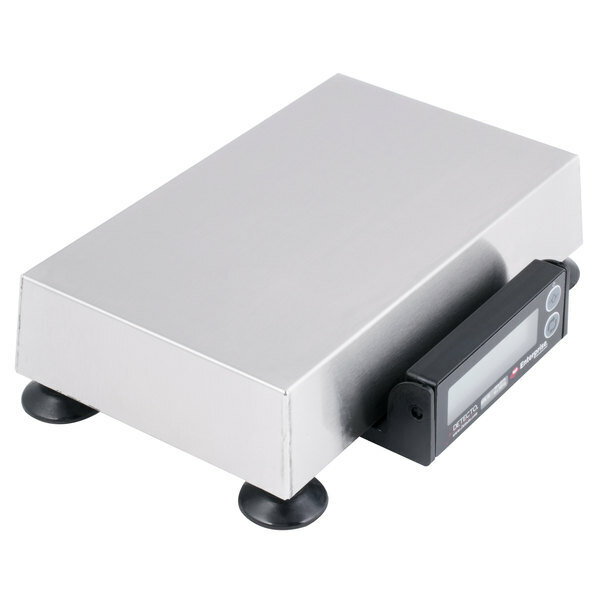 to 30 lb., this scale is legal for trade and designed for retail point of sale. 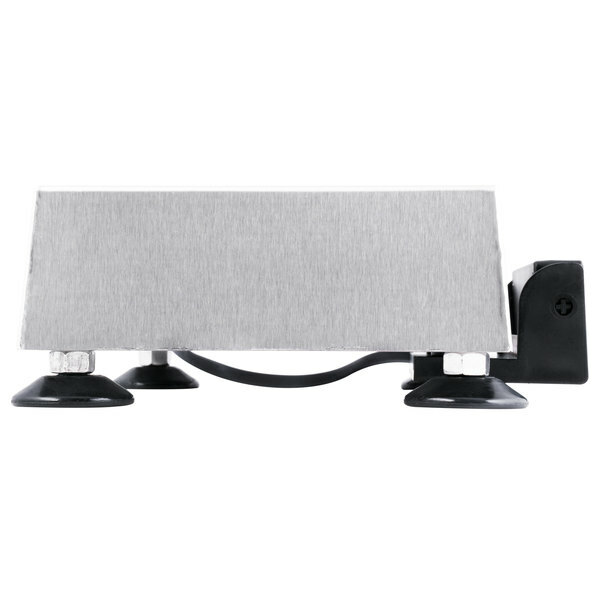 The 6" x 10" platform is made of stainless steel for long lasting durability. Additionally, each scale has built-in overload stops and integrates easily with most cash register systems and PC applications. With a green LCD display and bold black 11/16" high digits, the readout on this scale is visible in almost every lighting condition. Also, the display tilts to allow for easy viewing and two buttons control zeroing, power, and units of measure for simple operation. 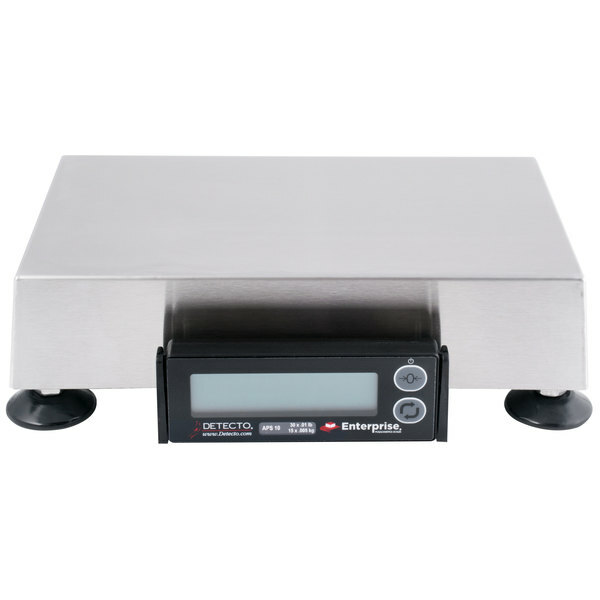 As part of the renowned Enterprise series, this scale is perfect for checkout areas, as a multi-purpose scale, and for controlling the weight of ingredients in a production setting. 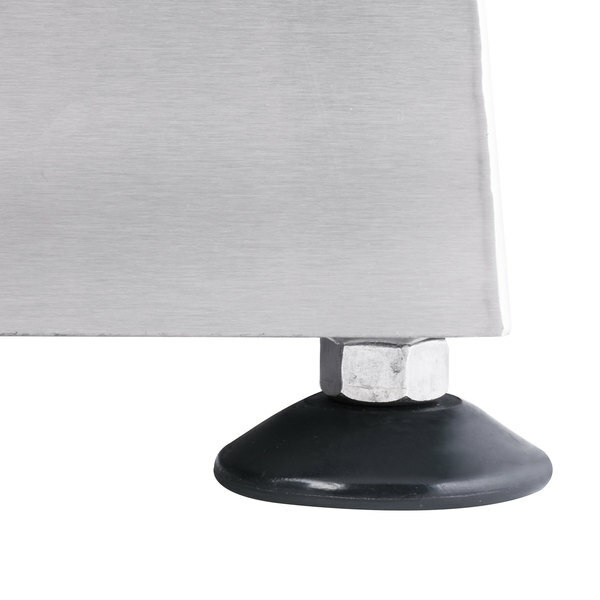 Each scale is constructed with a brushed stainless steel platform known for its durability. Adjustable leveling feet come standard to make it easy to balance the unit on any surface. The Detecto Enterprise series supports most major point of sale protocols and can be connected either through one USB-B port or three RS-232 serial ports. Each scale includes an AC adapter for power and one RS-232 serial cable to connect the scale to your register system. Accessories and features like Wi-Fi and Bluetooth connectivity, tower display, and remote mount are sold separately. 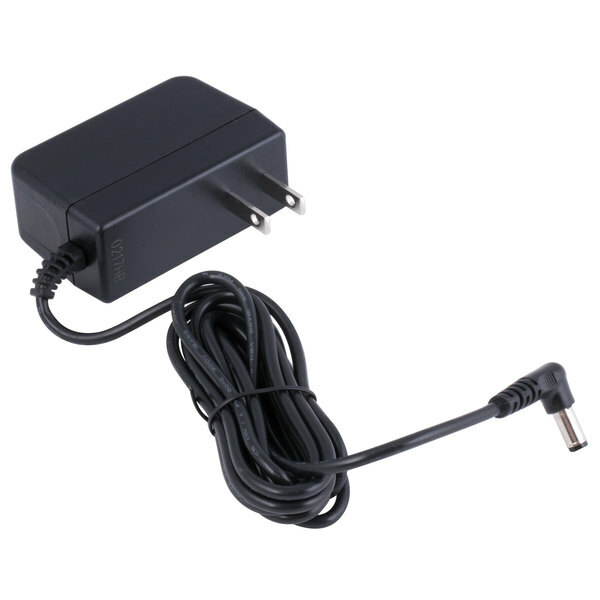 The Detecto APS10 comes with a 100-240V AC wall plug-in power adapter. It is rated as Class III accuracy for commercial weighing. 30 lb. x 0.01 lb. 15 kg. x 0.005 kg. 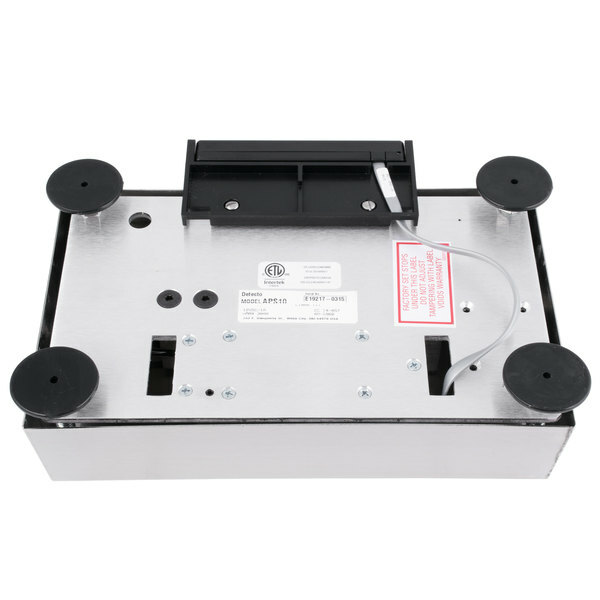 This item meets all government standards and requirements as set by the National Institute of Standards and Technology for scales and other weighing equipment. 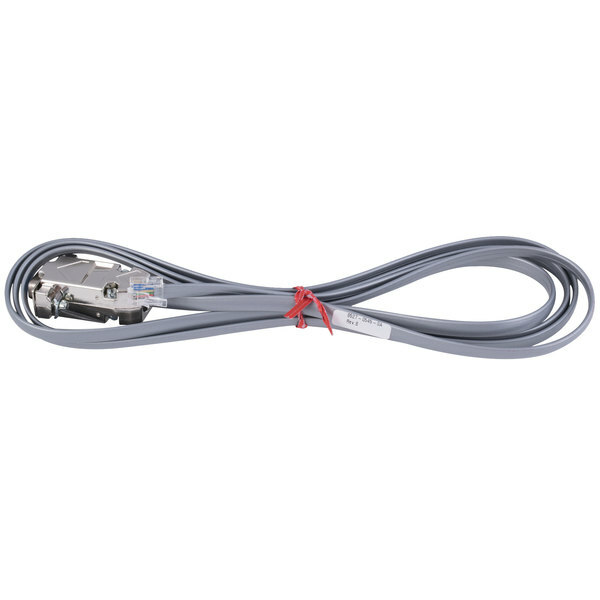 This unit comes with a NEMA 1-15P plug.